Shamans and medicine men are vastly revered for their knowledge and mysticism. Their ability to foretell the future whilst looking at the past. But, can they help you uncover the riches of your wildest dreams? that remains to be seen. 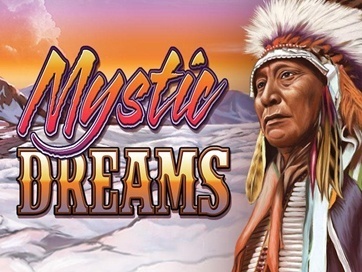 Microgaming have developed this next slot called Mystic Dreams and based it on the Native American theme, but will it stand the test of time? Mystic Dreams is a 5-reel, 243 ways to win slot, offering a worthy RTP of 96.6% to all you indian warriors. In the background you can see an Indian campsite settled in the snowy mountain scenery and the flickering flames of the fire burning. The music is almost an authentic blend of drums and sounds that you would expect to hear when in a camp such as this. Unfortunately, that’s where the similarities stop as the reels look overly modern in contrast to the background and that took a little of the shine away for us. Symbols include an Indian Chieftain, a buffalo, a wolf and an eagle which are you higher values. Down to the A, K, Q, J, 10 and 9 which make up your lower value symbols, which for some reason have been made more regal looking with the addition of gems and crowns. Bet Amounts – Betting on Mystic Dreams begins at 30p per spin and can be increased using the settings to a maximum of £30 per spin. Considering the higher RTP we are surprised the cost per spin is as low as is it is and we think players will certainly enjoy the benefit. Amend your bets by hitting the bet section and adjusting the coin value and coin level until your reach your desired amount. Wild Symbol – A dreamcatcher and tepee combination is your wild symbol in Mystic Dreams. It will substitute for all other symbols except the totem pole scatter. Scatter Symbol – Totem poles are widely revered as sacred in Native American culture, so of course the scatter symbol needed to be depicted with one. After all, if the totem pole can’t bring a bit of luck into your life what will? Land three or more of the totem pole scatters in adjacent spaces to trigger the feature. Scatter wins are also in play here and will pay out a prize amount on top of any line wins too. Check the pay tables for pay outs, as these change with the amount that is staked on each spin. 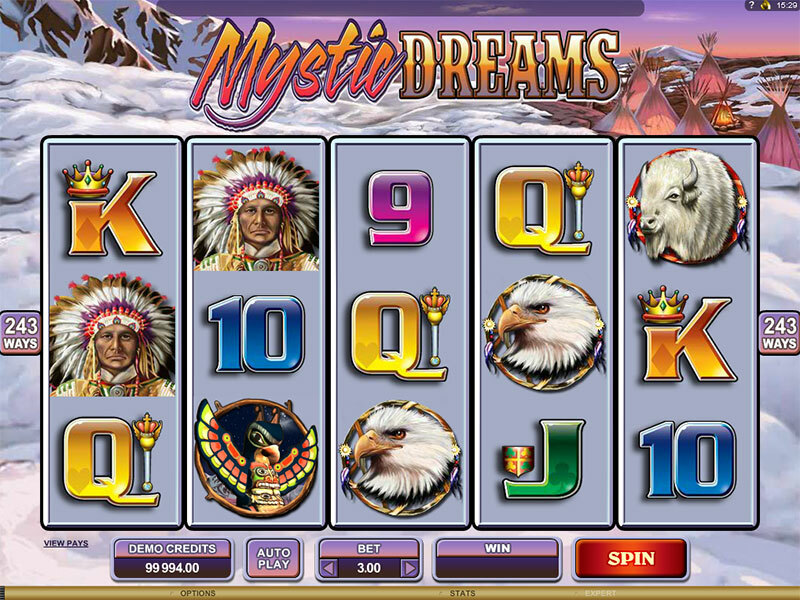 Bonus Spins Feature – Having collected three or more totem pole scatter symbols on Mystic Dreams you will enter the bonus spins round. The number of scatters you land on triggering the round will dictate the number of spins allocated to you. Bonus spins can be retriggered infinitely from within the round meaning much bigger win potentials. There is also a special wilds mini feature in play within the bonus round too, which can really benefit the player if the right combination lands. Wild Bonus Feature – Within the bonus spins round there is an extra feature available called the wild multiplier. As the reels spin if you land a tepee wild symbol on reels 2, 3 or 4 and they have formed part of a winning combination you will be given a special multiplier. Reel 4 will allocate a x4 multiplier. It doesn’t stop there, land multiple wilds on the required reels to multiply the multiplier! So, for instance if you landed a wild on reels 2, 3 and 4 at the same time you would receive a multiplier sum of 2x3x4 = x24 as win multiplier for that spin. This gives an infinite number of possibilities for wins and an increased chance of bigger wins too. Mystic Dreams is a clash of old meets new, it works in ways we couldn’t imagine until we began to play. Whilst we would have liked to have seen better features more in sync with the theme, the game itself played very well. Wins came along often enough in the base game and the bonus was fairly easy to trigger. Once you get your head around how the win multiplier works within the bonus round, it is easy to see why people are playing Mystic Dreams. Especially when you consider the cost per spin isn’t as high as you would expect from a game that pays out this way.